Make Your Marvel Legends Collection Legendary! popular product line that was initially produced by Toy Biz from 2002 through 2006 and then by Hasbro. 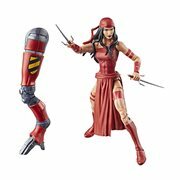 The Marvel Legends action figure line provides an exciting range of different sizes, from 6-inch scale (150 mm) to spinoff versions in 4-inch (100 mm), 8-inch (200 mm), and large 12-inch (300 mm) scale. They run the gamut from Avengers, Defenders, and X-Men like Marvel Legends Spider-Man, Captain America, Iron Man, Thor, Black Panther, Daredevil, and Ant-Man to the Guardians of the Galaxy. 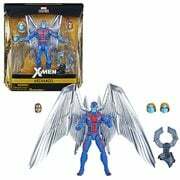 In addition, the line includes various non-figure Marvel Legends toys and collectibles to grab your attention, such as prop replicas and role-play items like the articulated, light-up Marvel Legends Infinity Gauntlet. And where will you find these wonders? Right here at Entertainment Earth! From the amazing characters found in Marvel Comics that also appear in the impressive array of movies seen in the Marvel Cinematic Universe, animated features, and more, comes an extremely popular product line that was initially produced by Toy Biz from 2002 through 2006 and then by Hasbro. 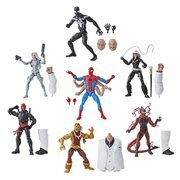 The Marvel Legends action figure line provides an exciting range of different sizes, from 6-inch scale (150 mm) to spinoff versions in 4-inch (100 mm), 8-inch (200 mm), and large 12-inch (300 mm) scale. They run the gamut from Avengers, Defenders, and X-Men like Marvel Legends Spider-Man, Captain America, Iron Man, Thor, Black Panther, Daredevil, and Ant-Man to the Guardians of the Galaxy. In addition, the line includes various non-figure Marvel Legends toys and collectibles to grab your attention, such as prop replicas and role-play items like the articulated, light-up Marvel Legends Infinity Gauntlet. And where will you find these wonders? Right here at Entertainment Earth! What Changed When Hasbro Took Over from Toy Biz? As of January 1, 2007, Hasbro became the license holder of the rights to produce MCU games and toys. The new Hasbro packaging did not include a comic book, and the new molds eliminated finger joints, which were a mainstay during the Toy Biz era. The company did continue with the theme of Build-A-Figure pieces, however. Also, rather than including entirely new figures, the chase concept evolved into variants (such as an alternate head or a different color scheme) of a character. These Fantastic Figures Were Almost Discontinued! During the late 2000s, production on the Marvel Legends series slowed down to the point where it was rumored that it might be cancelled, but Hasbro revealed at San Diego Comic-Con 2010 that due to fan requests and the upcoming movies based on the characters, the line would make a comeback in 2012. 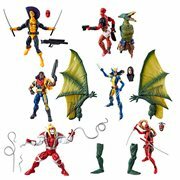 In January 2012, the product returned to store shelves, and at SDCC 2013, Hasbro announced that it would be given a new start as Marvel Legends Infinite. 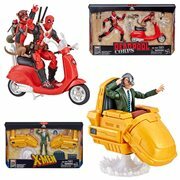 All this makes it possible for you to own the Marvel Legends Deadpool, Dr. Strange, Hulk, Punisher, Wolverine, Captain Marvel, and other figures you so covet from your favorite films and more. Aren't you glad? 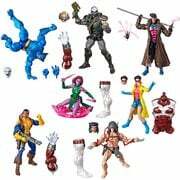 You might even find a fabulous Marvel Legends Thanos action figure or other incredible Marvel Legends Infinity War characters to add to your toy box or collection. So, go for it!